If your childhood included a beloved toy wagon, chances are you will find it in the pages of Coasting on Wheels, the first comprehensive published collection focusing on the childhood delight of toy wagons. Relive the joy and excitement of treasured memories through historical manufacturer reviews, updates on contemporary wagon companies, and hundreds of images including photographs, featured wagon art, and vintage advertisements, catalog pages, antique price listings, and patents. This comprehensive collection also includes a price guide organized by manufacturer that lists the wagon model, value in mint condition, and value after restoration. 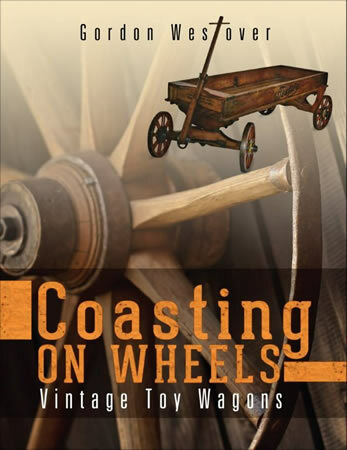 Coasting on Wheels expertly guides readers through two centuries of picturesque American history through the perspective of one of its most beloved toys, the wagon. I have been making upscale children's oak wagons for the last 10 years, providing customers with original antique wagons, restored antique wagons, classic reproduction antique wagons and large heavy-duty children's wagons. This is a one man business at my home in Sacramento CA. To create and handcraft each individual wagon with the greatest of care, making sure each customer is completely satisfied. My joy comes from each wagon created. Dating from the turn of the Century, 1900 to the 1950's. Some of the wagons have been completely restored and some with minor changes and some with no changes at all. These are "one of a kind" wagons. 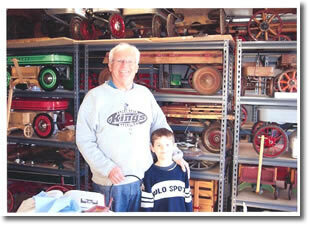 The website will be updated with additional antique wagons. Can be made upon request when available wagons are sold out. Care has been taken to make them with authentic likeness. These upscale large wagons want to prove themselves from the toughest hauling to the carrying of grandchildren. 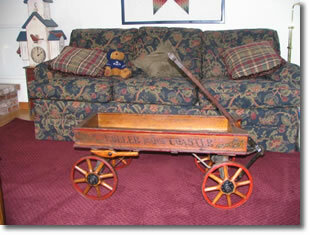 We have several small wagons appropriate for displaying bears and dolls. Three types of wheels are available for the "do-it-youselfer." Studebaker Junior Farm Wagon Blueprint Plans Available on eBay Store.